Lord Krishna classifies Bhakthas into four groups, aartha, artharthi, jijnasu and jnani in Gita (7-16). Of these aartha bhaktha is one who turns to the Lord only when he is in stress and distress. He is not interested in knowing about the nature of God; any God, any mode of worship will do and if this doesn’t yield results, there is always another God or a different mode of worship or both to turn to. Artharthi bhaktha is a steady bhaktha whose prayers and worship are mostly for success in material and worldly pursuits. Some of the arthathi bhakthas become disenchanted with wealth and worldly success and turn to spirituality and start enquiring about the nature of God. They have the basic idea of God as one residing up in the heaven, far away from the universe, is omnipotent, omniscient, compassionate and is the srishti, sthithi laya karanam for the universe. He now turns a jijnasu bhaktha, who is not praying for worldly wealth but for spiritual knowledge. When his quest for knowledge takes him to a Guru who comes in Vedic tradition, Vaidhika parampara, he learns that knowledge of God can be gained only by the study of scriptures like Gita, Upanishads and Brahma sutras under the guidance of a Guru. 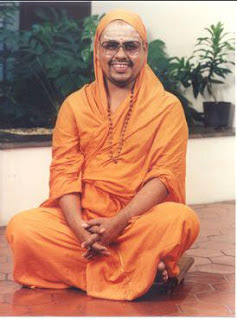 As a teevra Jijnasu bhaktha, he starts the study of Gita and upanishads sincerely under the Guru. When exposed to the scriptural teaching the jijnasu bhaktha learns about the Vedic view of God. With the new knowledge gained his view of the world changes initially and later the view of self as well undergoes a change as he blossoms into a Jnani bhaktha. Isavasya Upanishad in its opening mantra states “Isavasyam idagam sarvam yatkincha jagatyam jagat “ meaning “All this whatsoever moves on the earth (and those that moves not) should be covered by Iswara.” Iswara is Supreme Brahman that is God, is the Creator of this Jagat, the constantly changing universe. So He has karanam status in respect of this Jagat and the universe is the karyam. Karanam pervades the karyam and karyam is only karanam plus nama, rupa, i.e. name and form and nama, rupa have no substance. So the real nature of the universe is only Iswara. Purusha Suktham states “Purusa evedagam sarvam yadbhutam yacca bhavyam” meaning “All that is past, present and future is His manifestation”. Further the sthuthi Vishnu sahasranamam starts the thousand names with ‘Viswam’ and ‘Viswam’ means ‘the universe’. So whatever one sees as objects of the universe are all manifestations of Iswara only, in the vision of the Veda. So one need not go in for any mystic experience to have Iswara Darsanam but only have the attitudinal change training oneself to look at all things one encounters with Iswara bhavana discarding the prapancha bhavana. This Iswara dhrishti, vision of Iswara, is what is indicated in the Isavasya Upanishad mantra quoted earlier by the term ’covered with Iswara’. Lord Krishna as Iswara also declares in Gita (6-30); “He who sees Me everywhere (and in everything) and sees everything (everywhere) in Me, he never becomes separated from Me, nor do I become separated from him". The artharthi bhakthas’ idea of triangular format; Self, world and Iswara undergoes now a change to binary format; Self and Iswara only, world merging in Iswara. This change in view involves other changes as well as indicated in the latter part of the Isavasya mantra quoted which runs as “Tena tyaktena bhunjitha ma grdhah kasyasviddhanam” meaning “Enjoy that through renunciation. Do not covet (anybody’s wealth), for whose is wealth?)”. Tena tyakthena means with a sense of detachment. When one enjoys the world with Iswara Dhrishti only, one enjoys the world treating whatever one partakes of the world as a blessing of Iswara and with a sense of gratitude to Iswara. As everything is of Iswara only, one doesn’t entertain any sense of possession with regard to persons and things. In short one functions in this world without getting attached to objects or persons. As a corollary one does not have a desire for other’s possessions as well, whatever that may be. Dhanam stands for all possessions. The person may be involved in worldly karmas but then his attitude will be one of detachment and inner renunciation. chitram ramramyate tam tribhuvana-vapusham vishnum isam namami. Appreciation of Iswara as totality and everything else as belonging to Iswara leads to renunciation of mamakara, the idea that I am the owner of certain things with the new-born understanding that everything belongs to Iswara and I am only the current user of what I regard as my possessions. I am only the present lease-holder using the possessions for a temporary period. One’s view of ownership is replaced by usership and idea of controllership changes to contributorship. Iswara has two fold nature, Para prakrithi, the higher nature, and apara prakrithi, the lower nature. The pancha bhuthas; earth, water, fire, air, ether, and mind, intellect, ego in short the world that is matter including one’s sthula, sukshma sareera, constitutes apara prakriithi. Para Prakrithi is the Chaitanyam or pure Consciousness that makes the matter sentient by its blessing. 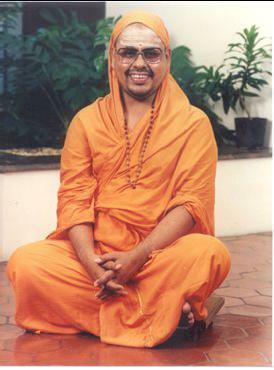 Iswara is Para prakrithi plus apara prakrithi i.e. Brahman plus maya. Vedas through Mahavakhya teach one that the Para prakṛthi, the higher nature of Iswara, called Brahman, the Consciousness, is present in all beings in the form of 'I', the very Self, the witness-experiencer of everything.